Martin Ljungdahl Eriksson is a Doctoral Candidate in Informatics with specialization work-integrated learning at University West. Martin’s research is about using sound as functional design elements to influence experiences and behaviors in the contemporary office. Together with Edsbyn, Martin has developed the Sound Bubble 2.0 which was shown at the Stockholm Furniture Fair in 2018. Today’s open offices and meeting spaces create great values in terms of togetherness, spontaneous meetings, better sharing of knowledge and information dissemination. At the same time, noise is a growing problem. In their research Edsbyn and Martin Ljungdahl Eriksson address this issue through personalized dynamic sound environments that create invisible spaces in the room. 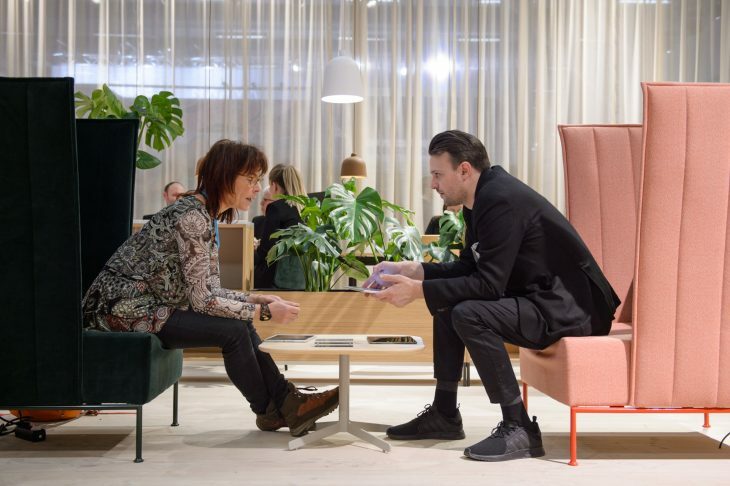 At the Stockholm Furniture Fair 2018, Sound Bubble 2.0 was presented as a new prototype where sound technology is implemented in Edsbyn’s chair, Resolve Play. With Sound Bubble 2.0, it’s possible to design your own personal sound environment, tailored to your own needs. In addition, Sound Bubble 2.0 interacts with other audio bubbles. This means that several people in each sound bubble get their sound environments adapted to a new common meeting environment. Would you like some more info about Sound Bubble 2.0? Please do not hesitate to contact Martin!